Waste Disposal and Recycling Equipment | J-Mec, Inc. Home - J-Mec, Inc. The Midwest’s leading distributor, installer, and service provider of Waste and Recycling Equipment. J-Mec, Incorporated is the Midwest’s leading distributor, installer, and service provider of waste and recycling equipment. Founded in 1992 by owner Jim Mechler, J-Mec has earned a longstanding reputation for product durability, creative problem solving, and service excellence. With over 100 years of combined staff experience, J-Mec’s knowledge of the waste and recycling industry is unsurpassed. Our company has grown to over 40 employees, including three regional sales representatives, 15 service technicians, and 25 fabricators. 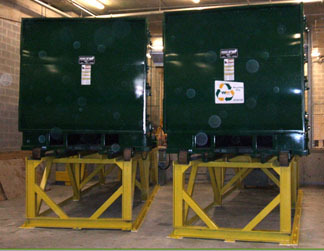 We provide the waste and recycling industry, along with commercial and industrial businesses, with installation, repair, and sales of compactors, balers, and recycling equipment. Our corporate headquarters facility in Lake Mills, Wisconsin has over 50,000 square feet of workspace and 15 acres of storage, allowing us to perform a multitude of jobs of any size.